IE9 (Internet Explorer 9) was first announced by Microsoft during MIX10 event on March 15, 2010, and had since released several pre-beta copies of IE9 Platform Preview versions, a minimal feature web browser mainly for developers. From September 15, 2010, general public is now able to to download and install a full working version of IE9 web browser, when a IE9 Beta launch event is scheduled. IE9 is not supported, and hence not available for Windows XP. Installing IE9 on Windows Vista or Windows 7 will automatically replace and remove the existing installation of IE7 or IE8. IE9 and IE8 or IE7 does not co-exist alongside (yet, at least until hack available). So, for users who want to use IE7 or IE8, do not upgrade, or make available another PC or virtual machine just to run IE7 or IE8. However, uninstall IE9 should also automatically rollback to IE7 or IE8. 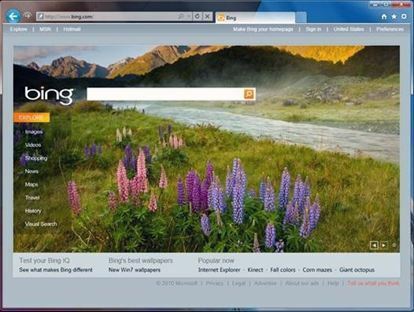 To download IE9 Beta, visit http://www.beautyoftheweb.com/. Beauty of the Web website releases a mini version installer that requires Internet connection during installation. User who wants the full version IE9 Beta setup installer, all download links to all languages of IE9 Beta full version installer is available athttp://windows.microsoft.com/en-US/internet-explorer/download/ie-9/worldwide, where user can download Internet Explorer 9 Beta in the language that matches the version of Windows. The English version which works with all versions of Windows Vista and Windows 7. Prior to installing IE9 Beta, do check out IE9 Beta release notes, and the product guide of IE9 Beta Product Guide in PDF and XPS format. 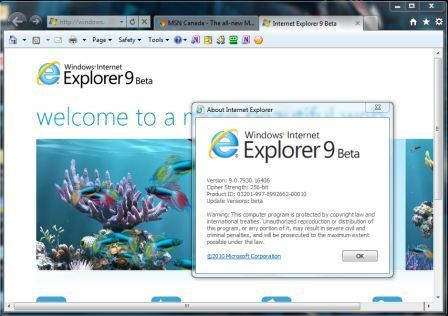 IE9 Beta is still a pre-release and not stable product, so if you are facing with too many bugs and annoyances, here’s how to uninstall and remove IE9. IE9 Beta has the build version number of 9.0.7930.16406.